Preheat oven to 350º F. Cream butter and sugar together. Add egg yolks (reserving the whites for later use), vanilla or almond extract, brandy, and milk, and beat to combine. Sift flour and baking powder together, and gradually stir into the batter to make a soft pastry dough. Wrap 1/3 of the dough to prevent drying, and refrigerate. Take 2/3 of the dough and roll it out to a shape that will fit into a 9″x13″ baking pan (or a round tart pan of similar surface area). Line the baking pan with a thin layer of pastry, allowing the edges to come up the sides of the pan to form a shallow tart crust. Spread the jam over the crust in a smooth, even layer. Roll out the remaining 1/3 of the pastry dough into a long, thin sheet, and cut into strips between ½ and ¾ inch wide. Arrange these strips in a lattice pattern on top of the jam in the baking sheet. Brush the top of the dough with the reserved egg white. 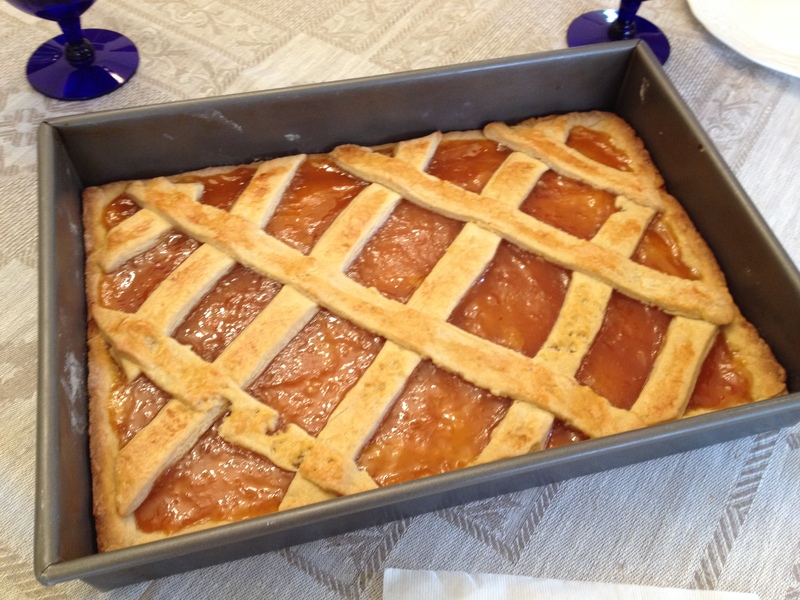 Bake the pastry for 45 minutes, until the lattice top is golden brown. Cool and serve. Makes 40 or more small pastry squares. This entry was posted in Desserts, Vegetarian and tagged Greek by Baron. Bookmark the permalink.